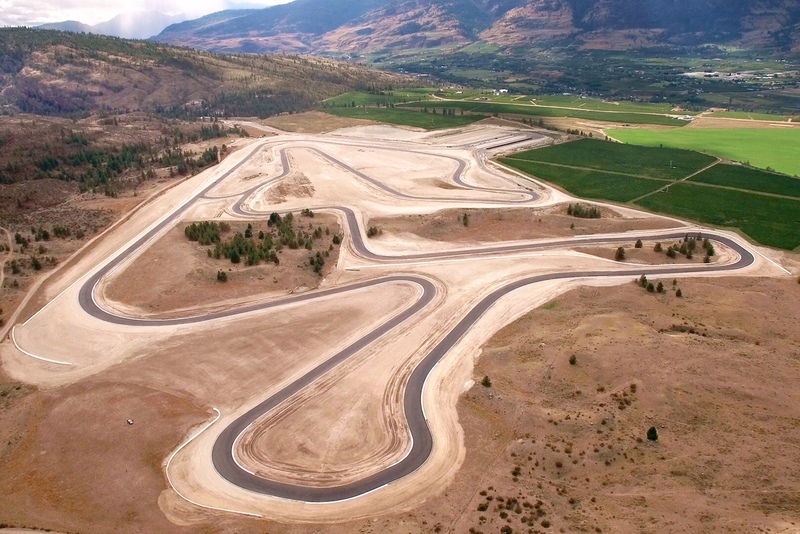 Area 27 is a world class racetrack designed by a culmination three Canadian racers: former Formula One World Champion Jacques Villeneuve, track builder Trevor Seibert of Lake Excavating and Area 27 President/General Manager Bill Drossos. Area 27’s name came from the mysterious Area 51 in Nevada and Jacques Villeneuve’s #27 racing number and is located in Oliver, BC in the beautiful Okanagan. The track is 4.83 kilometers in length, 12.2 meters in width and runs counter-clockwise. It is comprised of 16 corners (9 lefts and 7 rights) all of which make for a thrilling mix of fast sweepers, esses, 90 degree corners, increasing radius corners, decreasing radius corners, banked corners, elevation changes and long straightaways. The track is fast, technical, challenging and above all…fun!!! We strive for seven 15-20 minute sessions (3 in the morning and 4 after lunch) are planned for each participant in each group barring any delays or incidents. This is a fully catered event. All food and drinks are included. Includes breakfast consisting of , fruit, bagels, croissants, muffins, juice and water. Lunch is served consisting of either gourmet hamburgers, sandwiches ,pizza, wraps, vegetables, fruits. Beverages include water, juice, sports drinks and soft drinks. Brand Ambassador Hostesses will be keeping participants supplied with water and sports drinks throughout the day. Mini Classroom session with Professional Motorcycle Racers and Instructors. On track lead and follow laps focusing on techniques and skills learned in classroom sessions. Special section area for VIP Coaching clients lunch including an extended menu and Brand Ambassador Hostesses. Professional massage therapy in the paddock available on request. (TBD) extra cost. VIP snacks, water and refreshments served by Brand Ambassador Hostesses. Data log reports (coming soon). Highest priority waiting list, VIP Technical Inspection at your pit. Signed the waiver upon entering the track facility. Signed the waiver at registration. Motorcycle leather riding suit. One piece or two piece that zips together around entire waist. Suit must have hard armor in shoulders, elbows, forearms, knees and shins. Racing style full gauntlet style leather motorcycle gloves. Racing style leather motorcycle boots that fully cover ankles. All riding gear must be free of damage that may jeopardize rider safety such as being torn in vulnerable areas, malfunctioning zippers or helmets with severe scrapes or scratches. A clean motorcycle in good working order. Sound level max of 103db STRICTLY enforced by Area 27. Bring db killers/silencers in case you exceed the noise limit. No leaks of any kind. No loose nuts, bolts and fasteners. All nuts, bolts and fasteners should be tightened to proper torque specifications. No sharp edges such as pointed bar ends, foot-pegs, levers, windscreen bolts, etc. Brake and clutch levers must be complete with ball end. Taped up headlights, brake lights, turn signals, mirrors and speedometer. Masking tape or gaff tape is recommended. Adequate tire tread life with proper tire pressures for track riding. (Check with tire vendor if needed). Firm brake lever and brake pedal. Adequate brake pad thickness. Bleeding brakes and cleaning calipers prior to attending a trackday is highly recommended. Proper chain slack (a little loose is better than a little tight). Clip style master links should be safety wired & siliconed. Rivet style master links should have a dab of paint on them to be more visible to Technical Inspectors. Throttle snaps shut upon release at all handlebar positions. All aftermarket throttle devices must be removed. Smooth operating clutch. No frayed clutch cables. Suspension operates smoothly and has no oil leaks. Having sag set, compression and rebound damping adjusted is highly recommended. Steering head bearings properly adjusted. * Technical Inspectors have the final say in determining a pass at inspection. Please Note: All OPP Trackdays tickets include a $100 Track Fee paid to Area 27 . Existing customer, please log in!